The Internet In 2018 | Sharp Innovations Blog | Sharp Innovations, Inc.
“The only constant is change.” That’s how web development is defined, and in 2018 nothing will be different. Users are continuously expecting more from their online experiences. Content should be engaging, intuitive, and accessible everywhere in real-time, especially on mobile devices. Here are some online trends to watch in 2018. Browser extensions are key add-ons for the major browsers and have been for years. Extensions improve a browser’s user interface and make browsing easier for the user. WebExtensions APIs are now the only way to develop Firefox extensions since “As of November 2017, extensions must be built using WebExtensions APIs. Other toolsets, such as overlay add-ons, bootstrapped add-ons, and the Add-on SDK, are no longer supported.” As of Firefox 57, old extensions will no longer work. 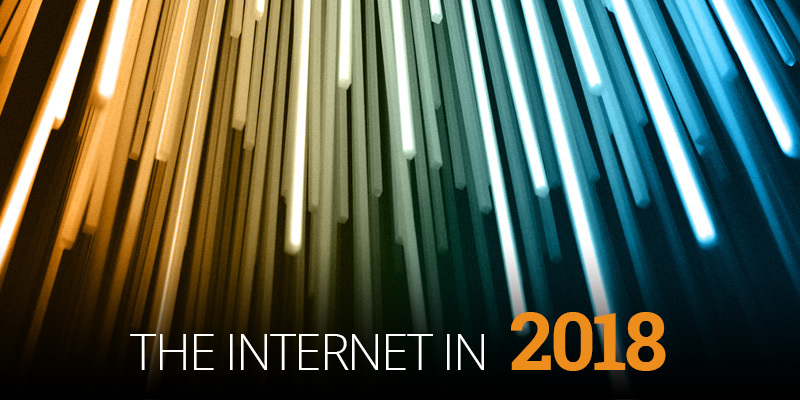 Real-time websites, based on websockets, are now more and more popular. Users want fast access to information and the ability to share that information instantly. The main idea behind real-time is that a connection between the client and the server is always open, and the data is updated as it becomes available. This replaces the need to refresh the page to see if something new has happened. For example, if you’re following a sporting event, you may be able to see a score listed as soon as it happens, and you may even be able to see the clock moving. Mobile use is no longer a trend, but should be considered a staple. According to Smart Insights, 80% of Internet users own a smartphone. With so many cell phone service providers giving away smartphones with their contracts, this number will only keep increasing. Google says 61% of users are unlikely to return to a mobile site if they have trouble accessing it, and 40% will visit a competitor’s site instead. According to a CMS Report, average smartphone conversion rates are up 64% compared to average desktop conversion rates. So the question is no longer “Does our website work on mobile?”, but “How does it work best on mobile?”. Your website is now an indispensable member of your sales force, and if terms such as Firefox 57 and websockets aren’t parts of your daily conversations, call on the web experts at Sharp Innovations. We understand these terms, and we can keep your website up to date and working hard to grow your business. Take Heart, Google Penguin is Near *Update* It's here!